books – Brendan Mancilla, Author. Ever wonder what it’d be like to work for Sauron? Or Voldemort? Or just about any other big-bad in fantasy literature? To be honest, it was a question I hadn’t pondered until THE BLACK COMPANY cunningly brought it up. Glen Cook’s fantasy exodus is narrated from the vantage point of Croaker, the historian of the mercenary group known the world over as the Black Company. For 400 years the company has moved from employer to employer, doing deeds and moving on. When their latest employer, a malignant ruler of the empire in the north who is known simply as the Lady, hires the Black Company to help her win her war against a rebel uprising, the spirited sell-swords are dragged into a terrible conflict. And, as it turns out, it proves to be a thrilling journey that is quickly paced, deviously plotted, and left me desperate for more. There’s so much to love about the Black Company. Maybe it’s Croaker, the historian and physician, who hasn’t quite lost his own spark of goodness. Not that the rest of the company has either, since the novel makes clear that good people can still do terrible things. Or maybe it’s the brilliantly written, stunningly executed antagonist known as the Lady. Sometimes mocking, sometimes cruel, but always brilliant—the Lady is a treatment on villains done exceptionally well. Perhaps it’s the web of strategy, betrayals, and subversion that the Company finds itself caught in amongst the Lady’s most ancient and dangerous servants, the Taken? Add to that the tried and true story of the Rebel fighting against the oppressors, but this time add in the horrors and realities of war, and the result is borderline magnificent. Reality is an omnipresent theme of the first novel in the omnibus set called the Chronicles of the Black Company. Croaker and the rest of the Company don’t read like the stereotypical military unit that is portrayed in other books and movies. Rather, it’s a band of outcasts who join together to try and create their own bizarre family while doing the work demanded of them to get paid. Make no mistake, the Black Company isn’t an easy read. In fact, it can be challenging because of the ideas it proposes and the grisly scenes it presents. But Croaker’s central tenet that the Company often picks the lesser of two evils and that morality is inherently subjective sets the stage expertly for the showdown between the imperial forces of the Lady and revolutionary army thrown together by the Rebel. Is either force really any better than the other? Is there a breaking point where the money doesn’t outweigh the values of morality? In several ways, The Black Company is a book that proposes questions but hardly bothers to answer any of them. In the end, Cook leaves us with a haunting scene. A pyrrhic victory. In a sense, the first book in the Chronicles proves to be something of an initiation rite for readers. By going through this haunting experience with characters that feel less imaginary and more real, Glen Cook does an amazing job of establishing his world and making its merits, successes, and losses all the more poignant. 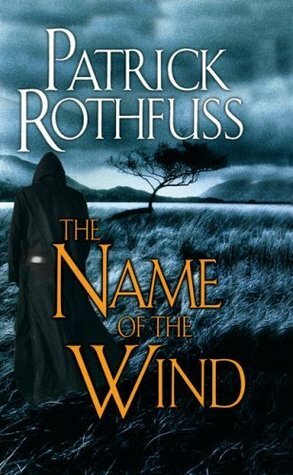 By no means does the debut novel of Patrick Rothfuss, THE NAME OF THE WIND, start with a bang. In the age of instant gratification and explosive action, The Name of the Wind reads more like poetry than prose. Originally published in 2007, this book had been on my radar for months in a “if I ever have the time I’ll definitely read that book” kind of way. Purchased as one of the eight novels of choice on my birthday, it was number four to be read from beginning to completion. Perhaps the most charming aspect of the story is the humble beginning in which it is strongly rooted. In the novel’s present, a man named Kvothe is hiding in a backwater town under the alias of Kote, the simple innkeeper who is almost nearly out of business. A chance encounter on a dangerous night brings a famous historian, aptly named Chronicler, to Kote’s inn. Chronicler has heard the tales and legends of Kvothe’s greatness and is allowed to record the truest version of the man’s life. The Name of the Wind, with its near constant emphasis on music, is lyrical in its composition and unabashedly meticulous in its execution. Rothfuss creates an enamoring world of magic and music, of friendship and betrayal, that doesn’t shy away from cruelty. Part of what makes Kvothe’s story so compelling is how unfair the world is to him, given that he so rarely catches a break. This level approach makes the character relatable in some aspects, irritating in others, but wholly realized and developed. It’s such an intimate story of a young man’s growth, a true bildungrsoman, because an adolescent Kvothe must come to terms with the challenges of his life as he attempts to reconcile his pursuit of education with his heroic, altruistic, and sometimes self-serving tendencies. Rothfuss pays judicisous attention to the Four Corners, the sub-section of the fantasy world that he’s created in which his story takes place. With the precision of a linguist, he subtly establishes the tonal differences that exist between the rival states as well as their cultural gaps—going so far as to remind us that Cealdish coin is good anywhere, but that Commonwealth currency will suffice in most other circumstances. In this benign method, Rothfuss gives us what we need to know about his world without bludgeoning us over the head with it. This, in my opinion, is expert fantasy craftsmanship at work. Eventually, the major challenge that The Name of the Wind faces is the format of its own story; this novel is day one in Kvothe’s promised three day recitation which means that there isn’t an overarching endeavor or singular goal that Kvothe is working towards in this first novel. Kvothe even admits, at the novel’s end, that it’s a satisfying foundation upon which the real story can be told. Either way, the content by and large allowed me to lose myself within the pages and the world of The Name of the Wind long enough to practically tear through it and thereby subdue my modest qualms. I highly recommend The Name of the Wind and feverishly anticipate the sequel, THE WISE MAN’S FEAR. At 11:36pm on Monday, September 2 2013, I completed the rough draft of my second full-length novel. It is, preliminarily, 211,722 words and numbers 388 pages on 8.5 by 11 inch pages set to a single-space lining. It’s hard to say exactly what I’m feeling, though relief and satisfaction (joy, maybe?) would be the obvious contenders. There’s so much work ahead but the difficult part, and the most enjoyable for that matter, are behind me. Editing is upon me, and I know I don’t fully comprehend what I’ve accomplished, but I am definitely…pleased. THE GRAVEYARD BOOK by Neil Gaiman was recommended to me last Christmas by an individual that I thought least likely to ever recommend any type of fantasy literature. That person raved and raved about it and then went on to teach me a lesson in stereotypes by outlining their other favorite fantasy novels, but I started with Neil Gaiman’s phenomenal novel, The Graveyard Book. I have to admit that this was my first ever Gaiman novel, though I knew the author’s name because I saw the movie version of STARDUST some years ago. I enjoyed STARDUST and promised myself that I would one day read the book, but while I never made the time for that I squeezed in the episode of DOCTOR WHO written by Gaiman, “THE DOCTOR’S WIFE”, and I was very impressed. Since then, I’ve had a strange fringe-relationship with Gaiman where I’m familiar-ish with the author despite never having technically ‘read‘ a word of his writing. When The Graveyard Book came to me so highly recommended from a person that I deeply respect, I picked it up without a moment’s delay. THE GRAVEYARD BOOK is, perhaps, one of the most difficult books to adequately review that I’ve ever encountered. It is one of those rare novels that examines the most valuable question that anyone has ever asked: what’s the purpose of life? The novel follows Bod Owens, a toddler who has escaped a dark fate and is taken in, quite literally, by the nearby graveyard and the phantoms that inhabit it. Its ghosts and tombs and natural beauty become the little boy’s home and there he grows up, all the while learning more about the world he must be protected from, until the day when the dangers of his past catch up with him. But do you want to know the truth? That might be what this book is about, but really it’s not about that at all. Gaiman is telling a personal, intimate story in this book. Not about himself, not necessarily, but certainly about everyone. This is a story about death, about growing up and growing old, and about Life. I’ve read some of the most stirring passages that I’ve ever encountered in my career as a reader within this novel. I love that it’s a children’s book that is still so dangerously adult. I love that I honestly wanted to cry at the end of this book—not manly, crocodile tears but little kid tears. That, I think, is what The Graveyard Book is about. The Affinity Bridge, by George Mann, was another one in the pile of books that I purchased as a birthday gift to myself. I know they say to never judge a book by it’s cover, but Mann’s cover certainly didn’t dissuade me from purchasing his novel. I am a fan of anything that flies in literature—private planes, jumbo jets, airships—for the practical utility they offer. So fast! So convenient! Mann’s cover then, an enormous airship above Victorian-Era London, sang to me in several ways. Newbury and Hobbes, the novel’s protagonists, are academics; researchers employed by the British Museum as a cover for their other job as Crown investigators for Queen Victoria. In this fictional steampunk England, Sir Maurice Newbury (think Holmes!) and his assistant Veronica Hobbes (elementary, dear Watson!) are attempting to solve the riddle of a string of murders when an airship crash in London diverts their attention elsewhere. What follows is a brisk story of industrial intrigue, precision investigations, and appropriately romping action. One of my more marked appreciations for this novel is perhaps the one that is most forward-thinking: Mann spins the trope of the helpless, witless assistant on its head. When it comes to endangered protagonists, I would argue that Hobbes does more of the saving than being saved; and true, Hobbes bumps into sexism on occasion, but Newbury insists on treating her as a fully capable equal. And, repeatedly, he is proven right when Hobbes is daringly more functional than he on occasion! Beyond that, the plot isn’t terribly thick. Queen Victoria is strangely interested in a civilian airship crash; paupers are being murdered by a “glowing policeman” and the two main characters have private matters to contend with along the way but Mann’s triumph here is the creation of a gripping alternate 1901 London. A London where technological revolution has placed clockwork men on the streets and airships high above. In a very noticeable way London 1901 is the third protagonist of this novel and any reader who appreciates a good detective story and Victorian-London to boot are certain to enjoy themselves. UPDATE: A quick jaunt around George Mann’s blog reveals that, in fact, there are multiple sequels to THE AFFINITY BRIDGE (which was published in 2009—where have I been?!) which I must now, delightedly, purchase! At a certain point, when we defy our own notion of success, we stop and take stock of our achievements. Today I hit a milestone that I was certain would not be coming anytime soon: 300 pages. When I hit 200 pages on a separate manuscript last year, it was one of the most memorable accomplishments in my career as a writer. Never, not once before, had I achieved such a monumental goal. With 300 pages under my belt, I now turn my gaze to 400 and wonder, inevitably, how the hell I’m going to get there? Thank you to everyone who has supported my creative process; I truly hope to have good news somewhere in the nearby future!